The differences between skill, ability and technique and also, explain how you can structure practices to enhance these components of fitness. 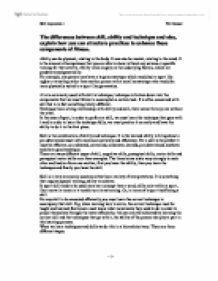 The differences between skill, ability and technique and also, explain how you can structure practices to enhance these components of fitness. Ability can be physical, relating to the body. It can also be mental, relating to the mind. It is the amount of competence that you are able to show without any serious or specific training for that activity. Ability relies largely on the underlying factors, which are predetermined genetically. For example, one person may have a large somatotype which would suit a sport like rugby or wrestling rather than another person with a small somatotype who would be more physically suited to a sport like gymnastics. A term commonly used with skill is technique, technique is broken down into the components that we must follow to accomplish a certain task. It is often concerned with skill but is in fact something totally different. Technique has a strong relationship with ability and skill, there cannot be any one without the other. In the case of sport, in order to perform a skill, we must learn the technique that goes with it and in order to learn the technique fully, we must practice it correctly and have the ability to do it in the first place. ...read more. Once a skill has been learnt, it is essential that it is practiced, as explained above, the skill in that area can be lost. There are ways to organise and structure practices to improve performance, technique and skill. The first is distributed practice, this involves the division of practice into sections to break down skills and separate them out so they are easier to learn and remember. An example of this would be a swimming practice session where the swimmers would complete a set, get out of the pool and receive feedback about the set they had just completed. This is good for beginners, as the feedback is very important at this stage, it is also good for those with low fitness levels. Another way of organising a practice is called massed practice. This is very good for people competing at elite level and for those with good fitness. The sets will have short breaks in between them to take on liquid and rest. This type of training is much harder. It may also focus on a "game" situation to prepare athletes for the real thing. ...read more. Finally, practices can be performed individually, where you train in isolation without contact from other players or doing the activity simultaneously to another athlete. They can be co-active, athletes perform at the same time as one-another but with no direct confrontation or physical contact. An example of this is an individual swimming event, (opposed to a relay) where you compete side-by-side. The last form is interactive, which is done under the direct influence of others. These apply in all invasion games such as rugby, football and hockey etc. In conclusion, there are many factors effecting learning through practice, they come in many forms. Some are fixed and some are variable, some require high levels of performance and some lower. All the factors have a direct influence in the building from ability, to learning the technique, to acquiring the skill and finally, locking the skill in the memory. So that it becomes autonomous and so grooved that we are able to perform the skill at any time with the minimum degree of effort and thought. But, still making the skill accurate and effective every time, making the user of that skill a great athlete in their sport. ?? ?? ?? ?? Skill Acquisition 1 Phil Durrant - 1 - ...read more. As I had increased, the seated leg curls and was pleased with the session. The next day I felt no pain; this was an improvement on previous weeks as I had previously felt pain in my arms and lower legs. They may need to avoid the tackle and changing the shape of the body whilst evading any harm is a necessity. Midfield players need to be agile when taking opposing players on, being able to twist and turn with the ball and able to confuse a player so you can beat them is a good skill to have. shown on the dynamometer Normative table of handgrip dynamometer The normative table has being created for the purpose of the sport-person and non-sport person to check in what category he/she is and if they need improving to be classified super. Gastrocnemius - is a muscle that forms most of the muscle commonly called the calf muscle. It starts at the back of the femur. Humerus - is the bone at the top of the arm. Mesomorphy - a somatotype characterized by muscularity. I could do the job of lifting and grabbing hold of the man from the lineout well, but when it comes to driving or protecting, my job would not be done as well as Phil's. 4. Rucking Rucking is not dissimilar from mauling, only the ball is on the ground.